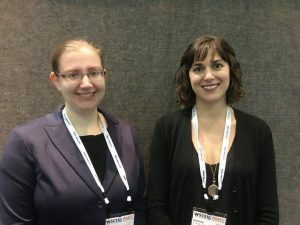 The 2016 World Stem Cell Summit poster prize winners include Mayo Clinic's Amanda K. Golden, research medical writer, and Rosalie M. Sterner, M.D.-Ph.D. student. Posters were judged on contribution to the field of regenerative medicine, scientific method, creativity and communicative power. The World Stem Cell Summit poster forum covered a variety of regenerative medicine and stem cell research topics, including science and medicine, business, finance, regulation and law, ethics, policy and communications. Mayo Clinic winners were selected in two categories: ELSI (ethics, legal, social issues) and Science & Medicine. Poster summary: Regenerative sciences and their applications in biology and medicine are currently underrepresented in Science, Technology, Engineering, and Mathematic (STEM) academics. Although opportunities to learn regenerative medicine concepts exist at the high school level, introduction at a younger age will be advantageous for both the students and the field. By introducing this field to students at a young age, we are providing the foundation to learn the fundamental concepts of regenerative medicine and inspiring the future regional and national regenerative medicine workforce. Poster summary: Manipulating mesenchymal cell development and differentiation in the protective bone marrow microenvironment results in making the protective environment more hostile to cells of the blood cancer acute myelogenous leukemia (AML) cells. This manipulation may allow for more complete leukemic cell eradication and prevention of relapse. The Mayo Clinic Center for Regenerative Medicine co-hosted the 2016 World Stem Cell Summit December 6-9 in West Palm Beach, FL. Organized by the Regenerative Medicine Foundation (RMF), the Summit forges collaborations to advance cell therapies, while creating a supportive environment of regulation, legislation, financing, reimbursement and patient advocacy. The World Stem Cell Summit poster forum is the only interdisciplinary stem cell poster session covering all topics in regenerative medicine. Posters display today’s most innovative science, leading-edge technologies, industry updates, and regulatory solutions.